Kids, this one’s for you! Día del Niño, a globally recognized holiday observed in Mexico on April 30, is all about celebrating and honoring children. And in true kid-friendly fashion, this means going all out with games, crafts, music and treats for a fun-filled day of appreciation. And that’s exactly what Marines Duarte, devoted mother and founder of the lifestyle blog “En tus Zapatos” intends to do. She has been plotting out her kids’ day of celebration for weeks, planning family-friendly crafts, recipes and surprises for all to enjoy. Below, Marines gives us the scoop on how she celebrates Día del Niño. What does celebrating “Día del Niño” mean for your family? First and foremost, I want to emphasize the significance of this celebration. It is a day that we spend together as a family, appreciating what we have. We make sure to explain how fortunate our kids are for simply having rights, love and opportunities they can take full advantage of—of course without forgetting about just being a kid! Kids are the center of happiness for the home and the world! You’re known for your DIY and kid-friendly activities—what are you planning to make with your kids this year? We love to create things using products we have laying around the house like ping pong racquets made of disposable plates. DIY activities are so fun! With just a small balloon and the disposable racquets, we can entertain ourselves for hours. For Día del Niño we’re planning to create our own “Jenga” game by cutting up sponges into long rectangular pieces. We’ll also go outside and design our own hopscotch game so we can jump around. You’re also surprising your kids with exciting updates for their rooms. How did you pull that together? My daughters have been asking for a change in their room for some time and to be honest, it was fairly easy since I only had to visit one store: Target! I love the Pillowfort collection because I can mix and match so many of the pieces including the sheets, pillows, lamps, rugs, frames, décor, etc. I fell in love with the designs, especially the Ruched Comforter Set and the Pinch Pleat Comforter Set. I also love the ice cream cone print because the colors are perfect for spring. I bought the Ice Cream Cone Throw Pillow, a rug and a nightstand. What are some unique ways that guests can celebrate Día del Niño with their own families? There are many ways, including cooking a traditional dish from their country of origin and eating together, or singing traditional songs that celebrate their culture, all of which provide enrichment for our kids. Even the simplest things can be the most fun, like dancing, jumping, flying a kite or playing outside, which makes us parents feel like kids again. 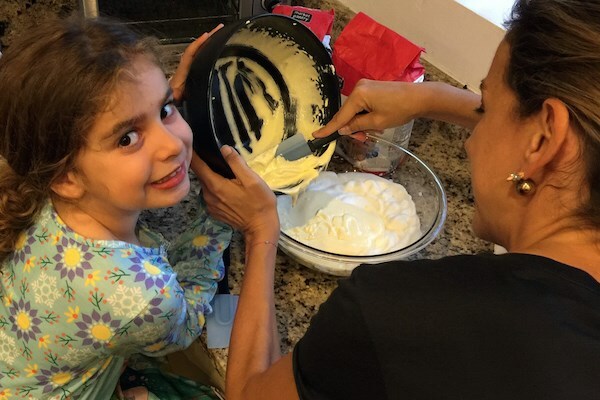 What are some of your favorite kid-friendly treats you like to make for your kids? My family loves dulce de leche (who doesn’t, right? ), so I like to make a dessert I grew up on that’s filled with dulce de leche. I used to help my mom make “El Pionono”as it’s known in my parent’s country Peru or “Brazo Gitano” in Venezuela, where I was born and raised. Cook's Note - Pro tip: You can also add more dulce de leche on top to decorate. My kids love doing that!